Four young workers were selected to participate in the 2015 Education in Action delegation to Guatemala, March 6-20, 2015: Sisters Amanda Buffalo, YEU, Whitehorse; Stephanie Vandewaeter, CIU, Calgary; Krysty Munns, Agri Local 30048, Lethbridge; and Michaele Kearns, UNE Local 60400, Fredericton. The young workers received a subsidy to pay expenses and airfare, but used their own personal leave. Moreover, the delegation included two members who paid their own way to participate in this year’s delegation: Sisters Linda Koenders, President UTE Local, NCR and Zaklina Mazur, Agriculture Local 0014, Ontario. Education in Action has inspired many PSAC members to get involved in meaningful solidarity with Guatemala. 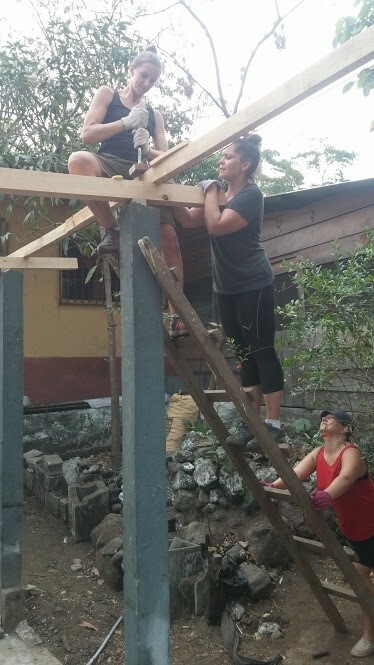 Thirty-two PSAC members have participated in the program to build homes for impoverished families in the rural areas of the Guatemalan highlands. So far, 82 homes, 3 community centres and kitchen and 3 schools have been built since 2006, when the program was founded by former PSAC member Roberto Miranda. The CCDA has been defending the economic, social and cultural rights of the Mayan people since 1982, struggling for equitable land distribution, carrying out sustainable agricultural development, and encouraging the economic empowerment of women. The CCDA also produces the organic and fairly traded coffee, Café Justicia, sold by volunteers across Canada. Café Justicia is made available to members through the SJF office in Ottawa. All proceeds are designated for the housing program, paying the salary of a full-time school teacher, improving access to potable water and food security for the population.